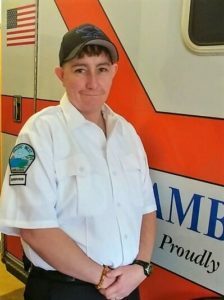 Theresa “Trese” has been a dedicated member of the Pacific West Ambulance team since September 14th, 2014 and has been in the EMS field since 2002. Trese has worked in many facets of providing emergency medical care, showing the ability to be versatile, knowledgeable, and compassionate. On a daily basis, she demonstrates being a team player with co-responders directing scenes, and by educating newer EMT’s and Paramedics. Trese was promoted to the position of Field Supervisor in the Spring of 2016, where she provides support to upper management, fellow supervisors, and field staff. Trese aspires to become a Field Trainer for new paramedics and EMT’s joining the Pacific West team. Trese’s vision is to improve training by bringing new and innovative ideas to the table and developing her employee’s skills and ability to advance in the EMS industry. It is with great pride that Pacific West Ambulance nominates Theresa Helstowski as our Star of Life for 2017. Trese Helstowski is a caring, devoted, and genuine individual; her commitment to high quality patient care shows in every step she takes with her job and every interaction she has with her patients. Our company and community thanks Trese for her unwavering service and countless hours of hard work.